There’s something about Anne Tyler’s books which is like sitting down to Sunday dinner. They are warm, and comforting, and resonant of home even if the home doesn’t exactly resemble one’s own. Within the pages I quickly become lost into the mood she spins: often quirky, often mellow, always tender. The significance of the plot begins to melt away as I absorb the characters’ lives and wonder how it is that they seem to express exactly what I feel. We may remember The Accidental Tourist. Dinner at the Homesick Restaurant. Back When We Were Grownups. Or, my personal favorite, Breathing Lessons, which was awarded the Pulitzer Prize in 1988. 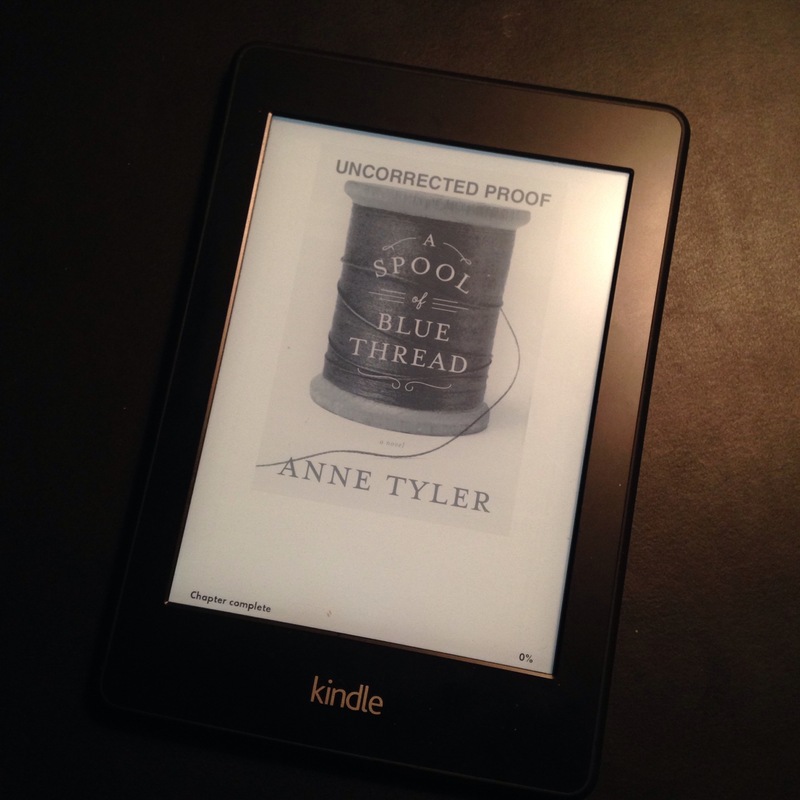 So with eager anticipation I read A Spool of Blue Thread, published just two days ago on February 10, 2015. The novel opens with Denny, a young man in whom I could easily envision my brother. Or, my son. He hangs up the phone after delivering astonishing news, leaving his parent wondering yet again where this trouble might lead, and just when it is, exactly, that they might hear from him again. The whole first part is dedicated to the actions of unreliable Denny, unwilling-to-answer-for-anything Denny, and I am half assuaged that there is another person who brought to his parents the discomfort my own son has sometimes created for me. Even if this person is fictional. Then abruptly, we open Part 2 to read the history of Denny’s paternal grandparents. We learn the background story of the Whitshank family, how they brought themselves up through sheer determination and hard work from the Depression to owning the home that Denny’s grandfather longed for from the moment he set his eyes on it. I am connected to these characters. I feel I could be one of Abby and Red’s children, fumbling around with Stem, Jeannie, Amanda and Denny as they go to the family beach vacation, or sit around the dinner table reminiscing over their childhood, or wondering what to do as their parents’ fragility becomes an issue that must be resolved. Abby is forgetful, like there’s a hitch in time she explains. Red is hard of hearing, misunderstanding conversations or staying out of them altogether. When Stem, the eldest, and his wife and children move in to take care of the aging couple, no one is more surprised than I, that Denny comes too, demanding why he wasn’t asked first to be the care-taker. For ultimately, family is family. The thread that ties us together cannot be broken. It may be fragile. It may be thin. But it comes from a spool that represents history, a specific history of events and imperfect love that is the foundation of every family. Thank you to Random House for this novel which I read in only a few days, a novel that is beautiful to its very last page, written as only Anne Tyler could do. I’m amazed and gratified that she keeps writing; I had no idea she had a new novel coming out until I read this! I am amazed, too, and the quality of this novel is not in the least bit diminished from the first one I read almost thirty years ago. She has a way of writing which takes my breath. Still. Now that I think about it, there was a period in Anne Tyler’s writing which I didn’t enjoy. I think Back When We Were Grown-Ups could have been in that time frame, it’s all very vague in my memory right now. But this particular novel is every bit as lovely as the ones in the beginning of her career, the ones that moved me to my toes. Ladder of Years was another one I do remember loving, though, besides Breathing Lessons. Yet A Spool of Blue Thread would be as good to pick up as either of those two. Gorgeous review. I read this book last week and you captured its essence perfectly. I’m ashamed to admit I’ve never read any of Anne Tyler’s novels (although I have seen and enjoyed some of the film adaptations of her work). I get the sense that she has a deep understanding of family relationships and writes with compassion and humanity. Lovely review as ever, Bellezza. Jacqui, with all the reading you do I hardly feel you could be justified in feeling “ashamed” at not reading a particular author (yet). For me, her earlier works were the best, but this one is indeed stellar. I don’t think you could go wrong reading this one, and if you like it, going back to Breathing Lessons or her most famous, Dinner At The Homesick Restaurant. and as I believe I saw it in one of your “recently received” stacks, now you can do just that! You’ll love this one, Diane, I just know it. It’s been such a long time since I read one of Anne Tyler’s books. I can recall LADDER OF YEARS and I think I also read BACK WHEN WE WERE GROWNUPS. Your review makes this book sound delightful. Just the thing at a certain moment. Good job! I haven’t read Back When We Were Grownups, yet, but I believe it’s tucked away on a shelf somewhere. This book was just that: delightful. Although, not without its sorrow. I love Anne Tyler’s novels, too, and look forward to reading her latest. Glad to hear it is another winner! I think you’ll enjoy it as much as I did, JoAnn. Very lovely review, Bellezza! You’ve conveyed some of the warmth of this novel. I think I need to read this one! Ohh my heart is aching already for this book thanks to your beautifully written review. I love Tyler’s books with a fierce kind of knowing. What a wonderful phrase you’ve used, “a fierce kind of knowing.” Yes, that’s how I feel, too. I have Breathing Lessons on my shelves but I have never got around to reading it. I need to bump it up. I have many other books by this author on my TBR and this one sounds pretty good too. It’s been at least twenty years since I’ve read Breathing Lessons,mbut I loved it so much I read it twice. I should revisit that book, and see how it would affect me now. At any rate, I hope you enjoy getting to know Anne Tyler.